Misha Ignatenko's mother was riding the bus home from work in their hometown of Zaporozhye, Ukraine, seven years ago when she came across a woman reading an English-language newspaper. She struck up a conversation and discovered that the woman was a professor who taught English in her free time. His mother asked if she'd be willing to tutor 15-year-old Misha. And for the past six years, Ignatenko has been asking himself the same question. He asked it when he decided to continue his English classes after he was rejected by an exchange program sponsored by the U.S. Department of Education. He asked it when he subsequently was offered the opportunity to study at a boarding school in New Hampshire. He asked it when he chose St. Scholastica from his personal list of 100 possible college options. "I wanted to do something different," he said, "something that's not normal or expected of me, something unpredictable." Even Ignatenko's first move upon arriving in Duluth was a bit outside the norm. Instead of living on campus, he looked to move in with a host family and was taken in by Tom Morgan, director of the Alworth Center for the Study of Peace & Justice and associate professor of Russian at CSS, and his wife, Julie. "I didn't know the Morgans at all, but I feel like we just connected when we met each other," he said. "It's been great." The hospitality has extended beyond the Morgans. "The entire campus population is extremely welcoming no matter who you are," he said. "The cultural adjustment can be a challenge for many international students, but I haven't experienced it at St. Scholastica because it's so welcoming." Because of this, he's been able to get involved with many different activities on campus. He has participated in theater, been in the Student Senate, joined the Mathematics Club, served as a teaching assistant in the Russian department, worked at the computer help desk and in the college communications department, run on the cross country team for a season and held a leadership position in the Investment Club. And it sounds like the club's attitude has rubbed off on him. "I've gotten a lot of scholarships, but for me they feel like an investment," he said. "I feel like Scholastica is making a bet on me and I want to prove that I was worthy of being given an opportunity by contributing back what I was given. Plus interest." Now he's now doing just that. After a previous internship with Citon Computer Corp. in Duluth and a semester spent studying in Washington, D.C., Ignatenko landed an internship at Thomson Reuters in Washington, D.C., last summer, where he blended his three majors — mathematics, computer science and finance. 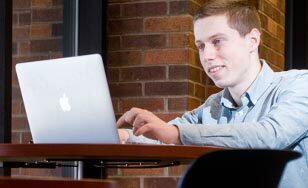 This practical experience has opened up a number of options for him once he graduates in May. He could attend one of the five graduate schools that have already accepted him or find a full-time job (he recently had an interview with Google). But regardless of where he ends up, he'll keep living the same personal philosophy that got him here. "If you're not making the best use of your limited time on Earth, then you're just not making the best of your life," he said. "And why not make the best of the limited opportunities, limited time and limited resources that you get? Why not see what you can do to challenge yourself?" "Scholastica enables you to get a great education, to travel along the way, to get involved in a bunch of student activities that are really rewarding and opens up opportunities that lead to you getting jobs in the real world." The Global Benedictine Scholarship paved Ignatenko’s way to CSS. It even carried over into his semester in Washington, D.C. Contact Ollie Meyer at omeyer@css.edu to learn more about this scholarship and take a look at all the other scholarships we offer. There are probably some you didn't even know we had.